Has Your Guttering Been Cleaned / Maintained Recently ? NVQ 3, twelve years on site experience. Working at Heights Qualification to use ladders complying with HSE. We are able to take care of your home or commercial building in a safe and environmentally friendly manner. 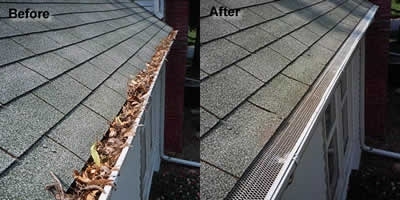 Gutter Clearing is one of the most important things you can do to maintain the beauty and value of your home or commercial building. Without regular gutter cleaning and clearing, gutters become full and heavy, they pull away from the wall and the proper angle of the gutter becomes distorted. As water overflows, it leaks behind the gutter and can travel into your home and also damage your foundations at best damage your fascia boards. If your building suffers water damage due to lack of maintenance, to the gutter or downpipes. Your insurance may hold you at fault leaving you unable to recover any loses. Call me for a free quote today! After arranging an appointment I will come to your property to unblock and clean gutters, downpipes and gully drains. I will remove all moss, silt, muck, leaves clear and brush out all major debris from the inside of the gutter by hand. All collected up into a bucket rather than all over the floor and disposed of. I will also rinse your gutter down with water to ensure everything is working as intended. Allowing your guttering system to work as designed to lead water away from the roof and walls, and minimise possibilities of water damage. Also as I am cleaning and clearing your Gutters and Downpipes I will check to see if any of your gutter needs repairing from basis minor repairs such as broken seals, brackets, clips or any other minor repair to full replacement if necessary of a section or more. Been a fully qualified joiner and carpenter I can carry out any work that needs doing there and then saving you having to call someone else out, saving you money time and hassle so when I leave you can be happy everything is working as it should. We can also install Gutter Syphons or Traps to the top of the downpipes and Gutter Guard or Hedgehog Gutter Guard to the internal of the gutter where applicable to help extend the period between the gutters needing clearing out again. Any leaks that cannot be repaired in the conventional manner then we can fibreglass the inside of the gutter to create a seamless gutter works great on plastic, cast-iron, metal and wooden gutters alike. Now the inside of your gutters are clear and washed down, what about the external appearance? If you have white gutters, you may want to enquire about an external gutter clean. This may include the fascia and soffit to complete the job. We like a challenge using a combination of Cherry Pickers and Scissor Lifts to accesses the inaccessible. As a fully qualified Powered Access Operator with IPAF you know your in safe hands. Don't Leave It Too Late Water Could Be Damaging Your Home Right Now!